Simic New Renaissance Galleries has Jane Seymour One Woman Weekend Art Festivals scheduled for Carmel, La Jolla, and Palm Desert, California. Each event will include receptions with the artist. 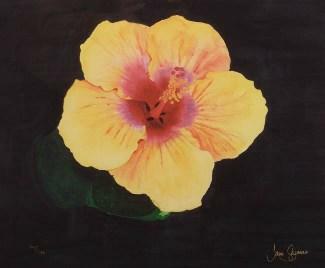 The image posted here is Hibiscus (Yellow) by Jane Seymour. See links to artwork by Jane Seymour and other celebrities at the Pop Life Art homepage. Update, July 25, 2008: Jane Seymour will return to Simic Galleries in La Jolla, October 17, 18, 19, 2008.